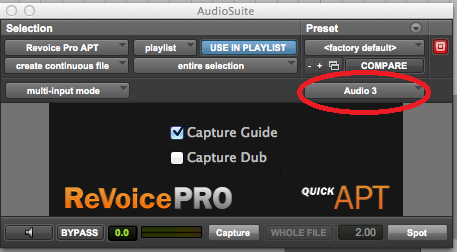 Use one of the methods below to send the processed audio to a selected Pro Tools track. Do nothing if you want the processed audio to return to Pro Tools into the track and position of the Dub audio in Pro Tools (if it is still selected). If “no track selected” is displayed instead of a track, manually select an area in any Pro Tools track. Press the Quick APT plug-in Spot button. The processed audio will be sent to the Pro Tools track selected.